The Papua New Guinea Government is committed to implementing reforms and measures that will enhance the transportation sector in the Asia Pacific region. 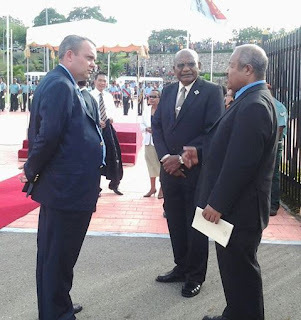 Minister for Lands and Minister assisting the Prime Minister on APEC Matters Justin Tkatchenko said this when officially opening the 10th Asia Pacific Economic Cooperation (APEC) Transportation Ministerial Meeting in Port Moresby on Saturday. Minister Tkatchenko, on behalf of Prime Minister Peter O’Neill, told the meeting that APEC economies represent more than half of global trade. “And the billions of people in our region depend on us to deliver efficient transport systems that will promote investment, enhance business and create jobs,” he said. The Transportation Ministers meeting is one of the 200 meetings that cover all sectors from tourism to investments leading up to the 2018 APEC Leaders Summit. He said efficient land, sea and air transportation infrastructure is fundamental to economic growth and community development. “However, we are faced with a different range of challenges and all of us in this room have a responsibility to be proactive. “All of our economies have different challenges, but for all of us ‘complacency is not an option,” he said. He said in the modern digital age, individual countries cannot respond to these challenges alone. “The challenges we face in the transportation sector are not just domestic, they are regional and global, and require multilateral action. “The theme on sustainability and innovation in the digital age complements the global call for sustainable development beyond boarders. “For our region, this is all about exploring innovative opportunities through modern technology platforms – while ensuring that we are still resilient and being inclusive with no one left behind. “We must embrace new and innovative products and services.” Tkatchenko said, “And we need to implement projects that will promote sustainable development while promoting inclusiveness in regional supply chains. “As APEC economies, we are very well aware of the 2016 ICAO Resolutions which was passed at it’s 39th Assembly. This includes action to formalise future standards and recommended practices on sustainability, and the Carbon Offsetting Scheme for International Aviation,” he said. Tkatchenko said a number of APEC economies, including PNG, have supported its voluntary implementation which starts in 2021. “As we implement reform, consultation is essential, so that we carry stakeholders with us and undertake reform together. This includes the role of women, support for SMEs, and concerns surrounding trafficking in human and wildlife. Global efforts have been undertaken to raise awareness and advocacy,” he said.